The one upside to STILL being terribly, uncomfortably pregnant is that I am STILL getting tons of mileage out of all the maternity pieces I sewed throughout my pregnancy! For example, here's what I'm wearing today... for a busy day of lying on the couch knitting a baby sweater and MAYBE waddling around my building for a one or two-block walk if I can manage it. Purple maternity top: my maternity modification of the Burda magazine 02-2010-122 knit top, made back in February (details here). Cost (fabric and magazine): $15. Cost per wear: $0.75. Black Mary Jane flats: Privo by Clarks. Cost: $80. Cost per wear: $0.80. Total Cost Per Wear (so far): $2.05. The skirt still fits great. The top fits but in retrospect I should have planned better for my expanding bosom--the empire seam under the bust is not really under the bust anymore. I did do quite a bit of FBA originally, but it just needed more length, I think. Whatever! Come on Cartoonist Baby... I don't want to be taking 40-week pictures next weekend! Oh, my gosh! I thought that you might have given birth by now. 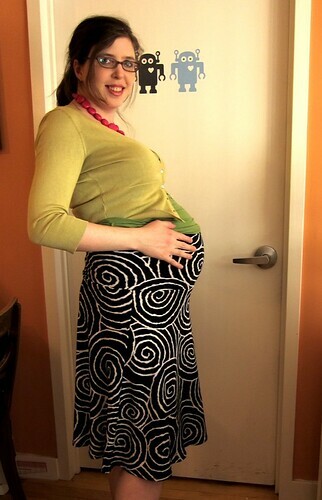 When I first started following your blog, you were pregnant then and I can't believe that you are still pregnant. Hang in there! I'm thinking good thoughts of you and your family. Rose in SV <--trying not to put her foot in her mouth. Looking great for 39 weeks! I won't tell you how late OUR cartoonist baby "shipped"....ugh. How do you like the Clarks? I saw some I really liked and online reviews are good but no-one I know wears them. oh, and did you ever get the tracing paper? If not, lmk and I'll send some more out! Sarah, I totally forgot to tell you--the tracing paper seemed great, I just haven't had a chance to order any yet since I still have a bunch of the other stuff. I LOVE Clarks--specifically, the cute Privo by Clarks that have rubbery soles and little bumps inside. Some regular Clarks are too stiff or just not very cute. I have a brown pair, black pair and purple pair of the Privos (about $80 new and less if on sale) and they are amazingly comfortable and great for long walks. You look lovely and happy. That is what counts. Baby will be here when she is ready. Thanks for the Clarks info! I think I'm definitely going to find a pair and try them out, I have just not been feeling the shoe love lately...I could really use walkable + cute! And what a great idea, amortizing the cost per wear of an outfit. Breaking it down by cost per compliment is fun, too. You DO know that the average first pregnancy length is 41 weeks, right? Sorry to burst your bubble...but the baby will come when it's ready. Enjoy your last few days being baby-free! Berry, I do know that... but my original due date was actually June 9, a few days ago, so I'm hoping June 18 is way off. Also, I really want her to show up before 41 weeks because otherwise I can't have her at the birth center (they risk women out after 41 weeks). But yeah, she'll show up when she feels like it. Beangirl, she is actually totally dropped and has been for weeks even if it doesn't look that way--I can breathe just fine now, but can barely walk. The midwife says she's at -1 station, so she's already in position. Good luck with Cartoonist Baby! I am two weeks behind you (37 weeks). 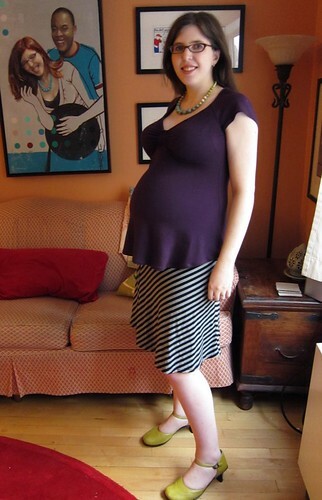 I used your explanations for maternity-ing knit tops, which worked great, so thank you!